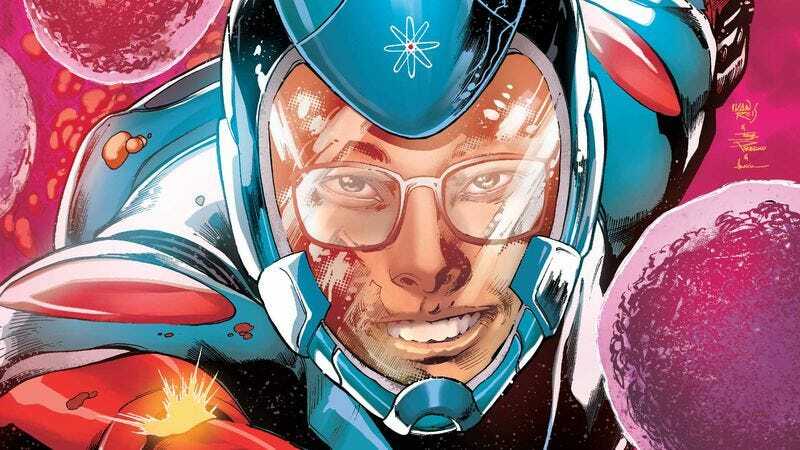 Ryan “The Atom” Choi disappeared from DC Comics in the New 52 era, but he was one of the old faces to return to the fold in the DC Rebirth special that kicked off the publisher’s current Rebirth phase. It’s been over half a year since then, but Ryan’s story finally continues in next week’s Justice League Of America: Atom, the first of four one-shots spotlighting members of Steve Orlando’s new Justice League Of America series debuting in February. Written by Orlando with art by Andy MacDonald and colorist John Rauch, JLA: Atom details Ryan’s first years at Ivy University, where he becomes the assistant and sidekick of Professor Ray Palmer, a.k.a. the size-changing superhero The Atom. This creative team did excellent work together on Detective Comics earlier this year, but their new story has a much smaller, more personal scale, delving into why Ryan is so passionate about science and how that ties into his superhero future. These preview pages quickly establish Ryan’s relationship with his parents and his origins in Hong Kong, accentuating Ryan’s alienation as he acclimates to a new school, new roommate, and new country. This preview begins with a rousing image of Ryan fighting tiny organisms on the edge of his own glasses, kicking off the issue with a rush of energy that sets a strong point of contrast for the more grounded storytelling that follows. MacDonald and Rauch handle both sides of the narrative very well, bringing power and drama to the superhero elements while taking a subtler approach for the character-driven moments. The miniature superhero Ryan exudes a cool confidence while the new college student Ryan radiates awkward uncertainty, and the big joy of this issue is seeing Ryan become more comfortable in his skin as he discovers his destiny.